Massage is one of the easiest ways of attaining and maintaining good health. Instinctively, we automatically rub a an ache in the neck or shoulder to ease pain, tension and discomfort or hold our temples on pressure points to relieve a headache. Headaches, Aches and Pains, Insomnia and Tension can all be alleviated with a good calming and Therapeutic Massage. Massage improves circulation, relaxes muscles, aids digestion and by stimulating the lymphatic system, it helps speed up the elimination of waste products. Sometimes the pain you are experiencing is actually referred pain. Massaging the area itself may help ease some of the tension of the muscle in spasm but does not release completely. 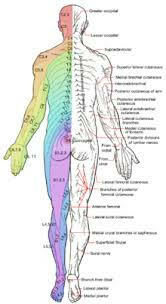 Knowing either the trigger point areas or even the nerve ending areas creating the problem. 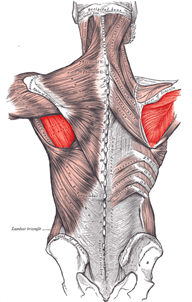 A Trigger point is a tight area within muscle tissue that causes pain in other parts of the body. A trigger point in the back, for example, may produce referral pain in the neck. Trigger point massage therapy alleviates the source of the pain through cycles of isolated pressure and release. The results and benefits of trigger point massage are releasing constricted areas in the muscles therefore alleviating pain. Sometimes also a pain can be caused from a compressed nerve in the spinal area for instance a pain in the forearm can be coming from a nerve ending compressed at T1 whereas a pain in the hand and thumb area can be coming from C6 . So these areas need to be addressed as well as rubbing the spot where the ain is felt. Different areas of the body are enervated by specific nerve endings Cervicals (C1 – C) Thoracic (T1 – T 12) Lumber (L1 – L5) or sacral (S1-S5) and massage will help release these areas. So the back massage is particularly important to help release nerve pain in the limbs, head and torso. 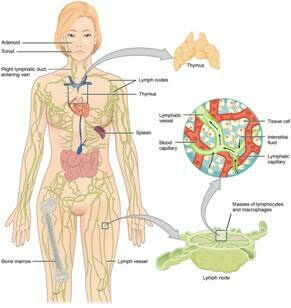 When the lymph system is overloaded and congested with the waste products it normally removes from the tissues, (evidenced by a build up of fluid in the tissues that can also be very inflamed), a very gentle pressure is applied with a rhythmic movement, in the right direction depending which area is affected, to stimulate and encourage the drainage to the lymph nodes and help disperse correctly. This is especially needed when movement and activity is reduced as the lymph system relies on the contraction of the smooth muscles tissue to pump the lymph vessels and propel the waste through to the lymph nodes up the body and eventually into the spleen which is the body’s equivalent to a garbage bin. Image By Mikael Häggström. Häggström, Mikael (2014). “Medical gallery of Mikael Häggström 2014”. WikiJournal of Medicine 1 (2). DOI:10.15347/wjm/2014.008. ISSN 2002-4436. Public Domain.